ناصح, حسن. (1395). ﻣﺪل ﺗﻮﺳﻌﺔ ﻓﻨﺎوری ﺧﺎﻧﻮادة ﺣﺎﻣﻞ ﻓﻀﺎﻳﻲ از ﻣﻨﻈﺮ ﺳﺎﻣﺎﻧﺔ ﭘﻴﺸﺮاﻧﺶ ﺑﺎ روﻳﻜﺮد ﻫﺰﻳﻨﻪ. علوم و فناوری فضایی, 9(4), 1-12. حسن ناصح. "ﻣﺪل ﺗﻮﺳﻌﺔ ﻓﻨﺎوری ﺧﺎﻧﻮادة ﺣﺎﻣﻞ ﻓﻀﺎﻳﻲ از ﻣﻨﻈﺮ ﺳﺎﻣﺎﻧﺔ ﭘﻴﺸﺮاﻧﺶ ﺑﺎ روﻳﻜﺮد ﻫﺰﻳﻨﻪ". 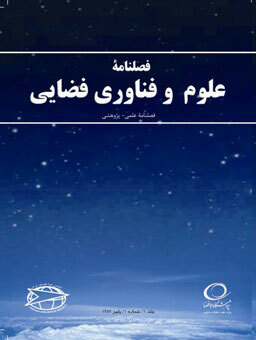 علوم و فناوری فضایی, 9, 4, 1395, 1-12. ناصح, حسن. (1395). 'ﻣﺪل ﺗﻮﺳﻌﺔ ﻓﻨﺎوری ﺧﺎﻧﻮادة ﺣﺎﻣﻞ ﻓﻀﺎﻳﻲ از ﻣﻨﻈﺮ ﺳﺎﻣﺎﻧﺔ ﭘﻴﺸﺮاﻧﺶ ﺑﺎ روﻳﻜﺮد ﻫﺰﻳﻨﻪ', علوم و فناوری فضایی, 9(4), pp. 1-12. ناصح, حسن. ﻣﺪل ﺗﻮﺳﻌﺔ ﻓﻨﺎوری ﺧﺎﻧﻮادة ﺣﺎﻣﻞ ﻓﻀﺎﻳﻲ از ﻣﻨﻈﺮ ﺳﺎﻣﺎﻧﺔ ﭘﻴﺸﺮاﻧﺶ ﺑﺎ روﻳﻜﺮد ﻫﺰﻳﻨﻪ. علوم و فناوری فضایی, 1395; 9(4): 1-12. هدف از این مقاله، ارائة مدل توسعة فناوری خانوادة حامل فضایی از منظر سامانة پیشرانش است. بنابراین در این مقاله، مدل تخمین و محاسبة هزینه توسعه دو نوع فناوری سامانة پیشرانش سرمازا و نیمه­سرمازا با استفاده از پردازش آماری توسعه داده شده و با یکدیگر مقایسه می­شوند. این مدل، دارای پنج گام اصلی است که عبارتند از، محاسبات جرمی‌انرژتیک سامانة پیشرانش خانوادة حامل فضایی؛ تحلیل و آنالیز هزینه؛ آنالیز حساسیت حجم مخزن پیشران؛ آنالیز حساسیت کارآیی سامانة پیشرانش نسبت به هزینه؛ محاسبات جرمی- انرژتیک و هزینه­ای سامانه­های پیشرانش سرمازا و نیمه­سرمازا. در نهایت ارزیابی نتایج حاصل از اجرای مدل با استفاده از مقادیر یک نمونه سامانة پیشرانش موجود صورت پذیرفته است. The major purpose of this paper is to present Space Launch System (SLS) family technology development from propulsion system aspect. Thus, the models of cost estimation for two types of propulsion systems (cryogenic and semi-cryogenic) are derived based on the statistical method and are then compared with each other. The SLS family modernization model includes five main steps:(1) SLS family propulsion system mass and energetic calculations; (2) Cost estimation and analysis; (3) Sensitivity analysis of propellant volume tanks; (4) Sensitivity analysis of propulsion system performance based on cost; (5) mass, energetic and cost calculations of cryogenic and semi-cryogenic propulsion systems. Finally, the results of the modernization methodology execution are verified by an existing propulsion system. Koelle, D., “Cost Efficiency as Design and Selection Criteria for Future Launch Vehicles,” Acta Astonautica. Vol. 57, International Astronautical Federation. 2005. “Closing the Business Case for Commercial Reusable Launch Vehicles. Futron Corporation. Bethesda,” MD, April 2002 (White paper). The Space Launch Industry Recent Trends and Near-Term Outlook. Futron Corporation. Bethesda, MD. Oct. 2004, (White paper). Commercial Space Transportation Forecasts. Federal Aviation Administration Commercial Space Transportation Advisory Committee, May 2013 (Report). Koelle, D. TRANSCOST 6.0: Statistical-Analytical Model for Cost Estimation and Economical Optimization of Space Transportation Systems, Trans Cost Systems, Ottobrunn, Germany, 1995. Koelle, H. H. and Johenning,B., Space Transportation Simulation Model (TRASIM 2.0), Technische Universität Berlin, Aerospace Institute, ILR Mitt. 319, 1997. Koelle, D., “Cost Engineering – The New Paradigm for Space Launch Vehicle Design,” Journal of Reducing Space Missions Cost, Vol. 1, No. 1. Dordrecht, The Netherlands: Kluwer Academic Publishers. 1998. Wertz, James R., “Economic Model of Reusable vs. Expendable Launch Vehicles,” Presented at the IAF Congress, Rio de Janeiro, Brazil, Oct. 2000. Griffin, D. and Claybaugh, M. and William, R., “On the Economics of Staging for Reusable Launch Vehicles,” Presented at the Space Technology and Applications International Forum, Albuquerque, NM, January 1996. Logsdon, J.M., Exploring The Unknown, Selected Documents in the History of the U.S. Civil Space Program, Volume IV: Accessing Space, National Aeronautics and Space Administration NASA History Division, Office of Policy and Plans, Washington, D.C., 1999. Matveev, The Methodology to Launch System Research during design, Mosco, Printed by Russia, 1993. Koelle, D.E., “Launch Vehicle Evolution: from Multistage Expendables to Single-stage Reusables,” Acta Astronautica, Vol. 14, 1986, pp. 159-166. Stamfl, E. and Meyer, L., “Assessment of Existing And Future Launch Vehicel Liquid Engine Development,” Acta Astronautica Vol. 17, No. 1, pp. 11-22, 1988. Uwe Hueter, Access-To-Space: Potential Future United States Launch Vehicle Transportation Systems, Acta Astronautica, Vol. 35, No. 9-11, 1995, pp. 753-761. Charania, A.C., Bradford, J.E. and Olds, J.R. “A Method For Strategic Technology Investment Prioritization for Advanced Space Transportation Systems,” 52nd International Astronautical Congress, 1-5 Oct, Toulouse, France, 2001. Boury, D., Munoz, M., Albert, A. and Lassalle, J. B. L., “Ariane 5 SRM Nozzle Evolution,” AIAA/ ASME/ SAE/ASEE, 38th Joint Propulsion Conference, July 7-10, Indianapolis, 2002. Naseh, H. and Mirshams, M., Lauch Vehicle Conceptual Design Software (LVCD), (Thesis M. Sc.) K. N. Toosi University of Technology, 2008 (In Persian). Mirshams, M., Karimi, H. and Naseh, H., “Multi-stage Liquid Propellant Launch Vehicle Conceptual Design (LVCD) Software Based on Combinatorial Optimization of Major Design Parameters,” Journal of Space Science & Technology (JSST), Vol. 1, No. 2, 2009, pp. 17-25 (In Persian). Naseh, H., Mirshams, M. and Naderifar, J., “Advanced Teaching Assistant for Multi-stage Space Launch System Design,” 14th International Conference of Iranian Aerospace Society, Iranian Industrial and Scientific Researches Organization, 2-4 March 2015 (In Persian). Mirshams, M., Naseh, H., Taei, H. and Fazeley, H.R., “Liquid Propellant Engine Conceptual Design by using a Fuzzy-Multi-Objective Genetic Algorithm (MOGA) Optimization Method,” Journal of Aerospace Engineering, Vol. 228, No. 14, 2014, pp 2587-2603. Mirshams, M., Naseh, H. and Fazeley, H.R., “Multi-Objective Multidisciplinary Design of Space Launch System using Holistic Concurrent Design,” Journal of Aerospace, Science and Technology, Vol. 33, Issue 1, 2014, pp 40–54. Naseh, H., Space Systems (Space Launch System) Modernization Model from Propulsion Systems Approaches, Technical Reports, Aerospace Research Institute (ARI), 1394 (In Persian). Huzel, D.K. and Huang, D.H., Modern Engineering for Design of Liquid Propellant Rocket Engines, American Institute of Aeronautics & Ast, 1992. Mirshams, M., Naseh, H. and Mirdamadian, M., “Sensivity Analysis of Liquid Engine System Parameters on Space Launch System Ballistic Chaacteristics,” The 1st Symposium on Space Launch System, K.N.Toosi University of Technology, 12-13 Nov., 2011 (In Persian). Bruno, C. and Antonio, G., Accettura,Advanced Propulsion Systems and Technologies, Today to 2020, AIAA, 2008. Availabel: [on line], https://en.wikipedia.org/wiki/ Angara %28 rocketfamily%29.